U.S. Department of Housing and Urban Development (HUD) Secretary Ben Carson alongside HACA, its development partners Atlantic | Pacific Communities and Madhouse Development Services, and the Austin community recently celebrated the groundbreaking of HACA’s first redevelopment of one of its public housing properties, Goodrich Place. 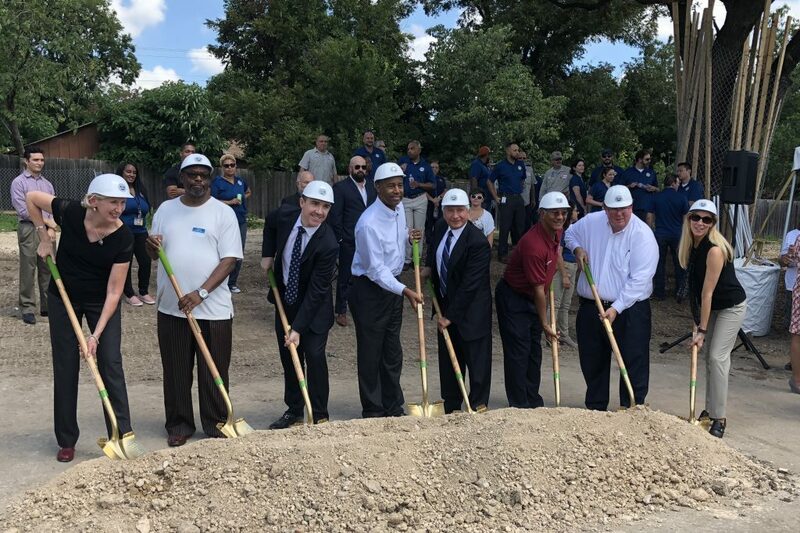 The celebration commenced with a groundbreaking ceremony, declaring the official redevelopment of the new community – renamed Pathways at Goodrich Place. HACA and its development partners also presented a $4,000 check to Zilker Elementary School benefiting literacy programs for students. Other dignitaries in attendance included: Federal Housing Commissioner Brian Montgomery, HUD Regional Administrator Beth Van Duyne, HACA President & CEO Michael Gerber, Madhouse Development President Henry Flores, Atlantic | Pacific Communities Senior Vice President Dan Wilson, Goodrich Resident Council President Jerry Dawson, and Austin City Council Member Ann Kitchen. Goodrich Place is being redeveloped as part of HUD’s Rental Assistance Demonstration (RAD), a bold federal initiative to improve the quality and availability of federally assisted housing. According to HUD, Pathways at Goodrich Place represents the 100,000th public housing unit being converted through RAD. The redevelopment will result in significant quality of life improvements for residents and the community. Pathways at Goodrich Place will include modern features like a fully-furnished clubhouse, business center with computer and internet access, fitness center, onsite laundry facilities, playground, and community meeting room. Updated units will include washer and dryer hookups, walk-in closets, covered patios and balconies, high-speed cable and internet access, 9-foot ceilings, and green features like Energy-Star or equivalent rated appliances. Residents will have access to onsite health and wellness programs, youth enrichment activities and job training opportunities.